I’ll admit to being a little snap-and-share happy when my first daughter was born. My poor Facebook friends were completely spammed with dozens of pictures of her squished-up little face – sleeping, smiling, in every outfit or with every cuddly toy bestowed upon her in hospital and beyond. Things have changed a lot since then – spooked by warnings of breaching my kids’ privacy, most of those early photos have been deleted. Pictures are now posted more sparingly, on birthdays and other special occasions. Whatever your thoughts on sharing photos of children on social media, there’s no doubt it’s a popular pastime for parents all over the world. Let’s face it, we all know an oversharer or two. 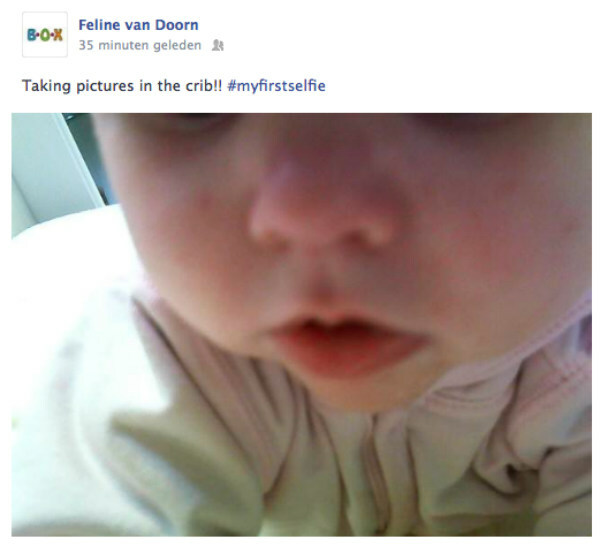 So it was only a matter of time before someone developed a gadget to let babies take and post their own pictures. 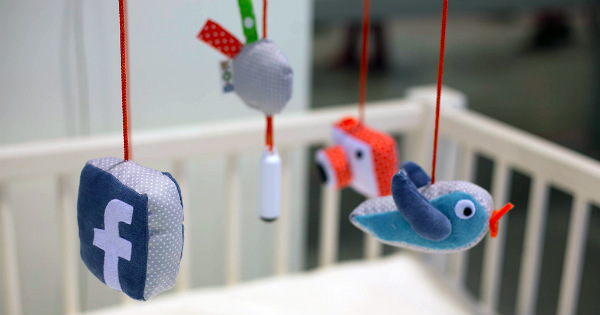 Dutch design student Laura Cornet is first past the post with her New Born Fame creation. 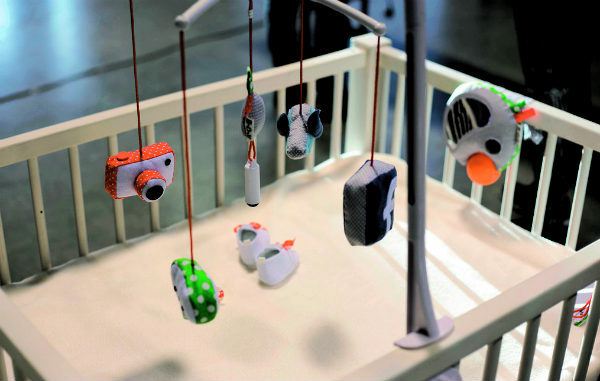 It’s essentially a cot mobile – except that the attached toys are actually cameras and GPS trackers that post online when triggered by the baby’s movements. Two of the toys are Twitter and Facebook icons, which film and post videos as the baby reaches toward them. There is a pair of shoes with an internal pedometer that records the baby’s kicks and posts activity charts online. A squeezable GPS tracker logs the babys location. A “selfie ball” takes and uploads a photo each time the baby rotates it. Ms Cornet developed New Born Fame for her graduation project as a sort of social commentary, after learning that nearly half of newborns get an online presence in their first 24 hours. “But the babies didn’t agree to having their photos put up online,” she tells CNN. She says she wanted to explore “who owns the right to put a baby on the internet”. “The baby isn’t old enough to be aware of it, but if the mother decides, it is accepted. I question if the mother/father in this case are actually the ones to decide,” she tells FastCoDesign. The reaction to her mobile has been mixed, with many people angry that babies would be so exposed to social media. “It was proving my statement, I was really happy,” she tells CNN. And while she admits she would be reluctant to use the mobile herself, she does think there is a legitimate use for it and is open to bringing her prototype to a wider market. “For instance if the kid is at the babysitter, (the ball) can send pictures to your phone. It can be an alternative to a baby monitor/intercom. It can be used to see the development of a baby, even,” she tells FastCoDrive. Still, she tells CNN she is altering the prototype to make it send images and videos to parents’ phones instead of straight to social media. Would you use a mobile like this? How do you feel about sharing your kids’ photos online?